Thursday I had the opportunity to do something fun and free. 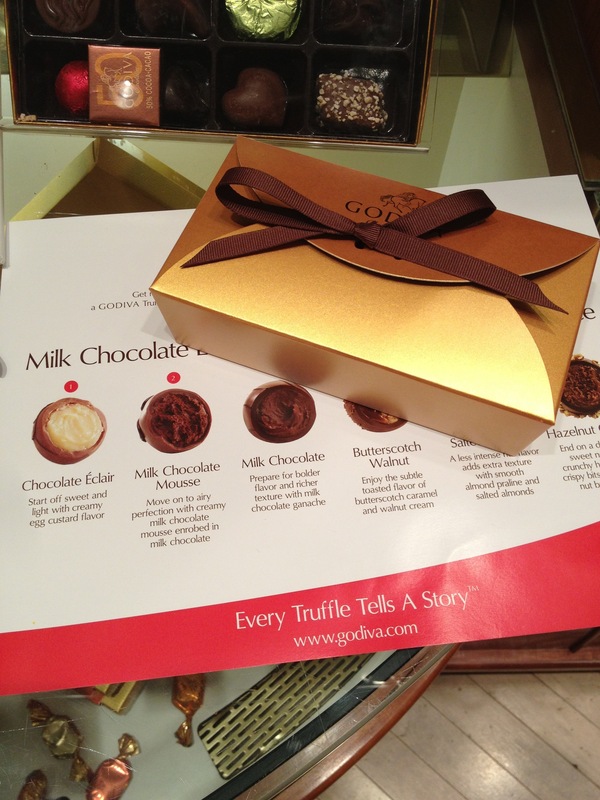 I participated in a complimentary Godiva Truffle Flight tasting. Earlier in the week I got an email saying my local Godiva store would be offering this experience for one night only. The email instructed me to call and schedule my appointment. When I called, they were very clear that if you were not on time for your appointment, you would not be able to participate. My parents were in town to take me out to dinner for my birthday, and I thought it would be a delicious way to end the evening. So, after dinner, the three of us headed over to the Godiva store, not really knowing what to expect. There were about 10 people participating in the flight at the same time we were. Each station was set up with its own gold box of six truffles, a tasting chart, an ink pen for taking tasting notes, and a cup of water. Each station was set up like this. It was set up very similar to a wine tasting if you’ve ever done one of those. 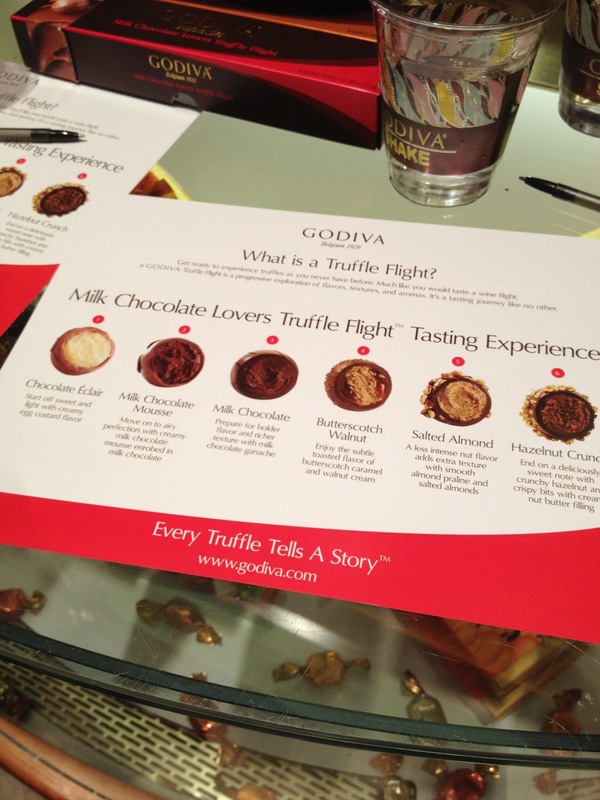 Godiva offers six different truffle flights, and we got to experience the Milk Chocolate Lovers Truffle Flight. The six truffles offered were Chocolate Éclair, Milk Chocolate Mousse, Milk Chocolate, Butterscotch Walnut, Salted Almond, and Hazelnut Crunch. My favorites were Chocolate Éclair, and Butterscotch Walnut. The interesting thing about Butterscotch Walnut is that it was created for Godiva by Duff Goldman, of Food Network’s Ace of Cakes fame. The experience only lasted about 20 minutes, and I was only able to have a little bite of each, being full from dinner. We were able to take the rest of our chocolates home with us, though. All three of us really enjoyed it. 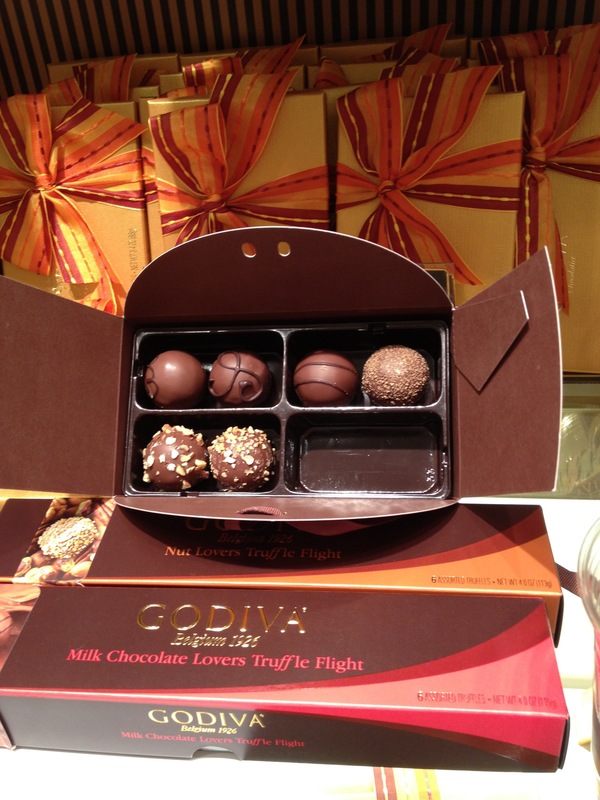 Each flight box sells for $16 in the stores, so to be able to experience this for free was very generous of Godiva. 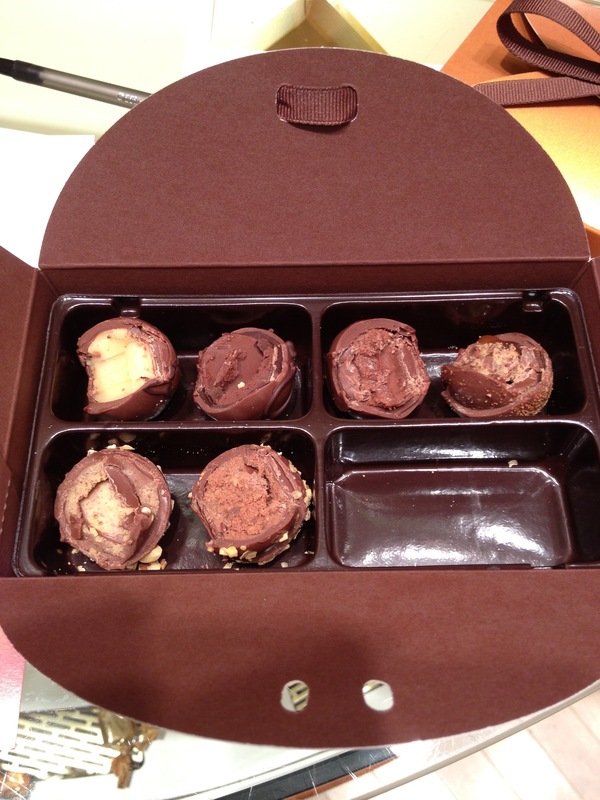 Have you tried Godiva’s truffle flights? Like my Facebook page at http://facebook.com/myglasssneaker. I am a charity athlete raising money for St. Jude. To make a donation, click here. I am super behind on all the things I want to blog about. I hope to get you all caught up this week on what I’ve been up to. Last week was a holiday week (Happy Labor Day!) and I hope everyone enjoyed their short week/long weekend if you got one. I certainly did, but that also means a busy week of playing catch up! I thought I’d share with you how I spent my Labor Day. I’m not sure about the back story of this or if it’s even really a “thing” but where I grew up, Labor Day Stew was a tradition. There was a church close to where I lived as a child (where my parents still live) that would sell stew every Labor Day as a fund-raiser. The men of the church would get up early and start cooking in kettle pots over an open fire. This was the best stuff ever! You had to bring your own container to put it in, and my dad would get a big gallon jug of it. I’m not sure when they stopped doing that, but for years we missed it and craved it. Then, probably about 15 years ago, we went to Charleston, SC to visit my college friend, Amy, and her husband, Dan. We went to Disney World right after that and passed through Brunswick, GA. I picked up a recipe card there for Brunswick Stew. My dad tried his hand at making it that fall, and it’s been a hit with my family ever since. He has tweaked the recipe a bit through the years, though I won’t share his changes. I’m not sure I even know all of the changes. 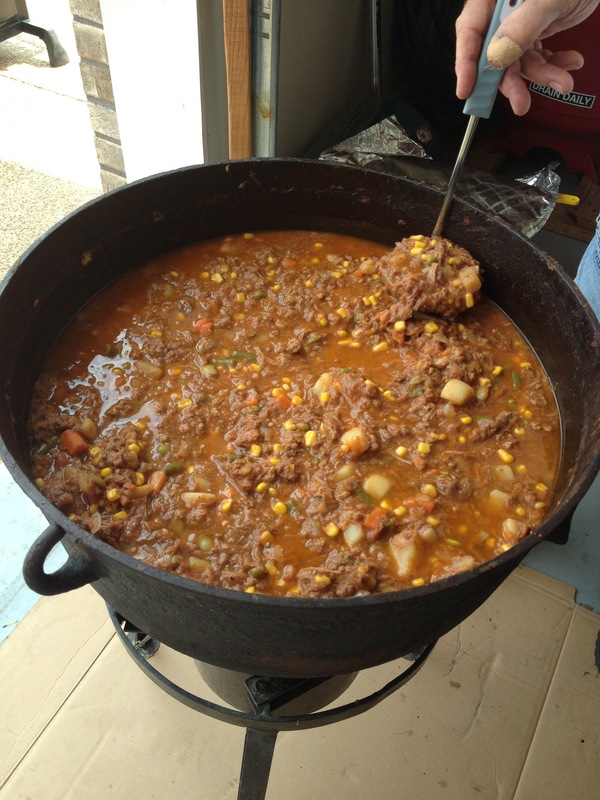 We picked this recipe up for Brunswick Stew about 15 years ago, and it’s now a family fave! About three or four years ago, my cousin resurrected the Labor Day Stew tradition at her house, using my uncle’s (her father) recipe. 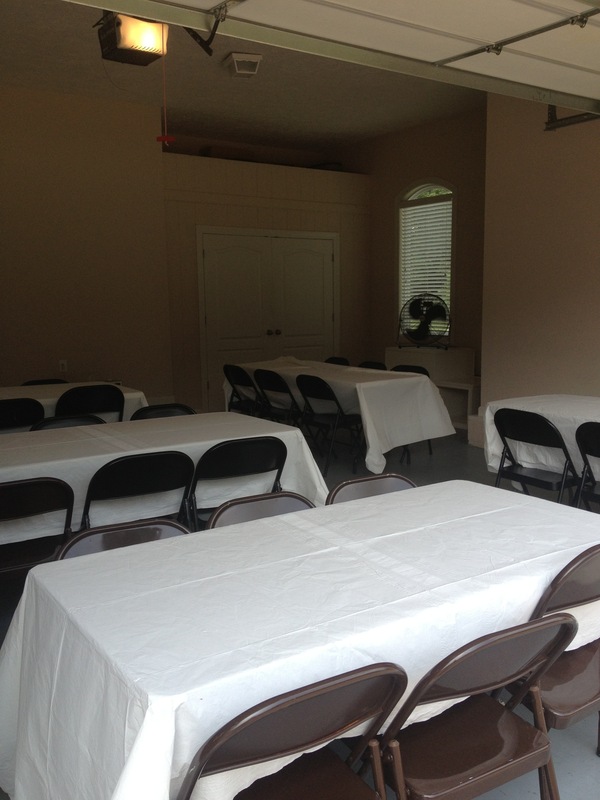 My cousin set up tables in her garage for the Labor Day Stew. She and her husband once again cooked it up in a huge cast iron kettle pot over an open flame, a gas one. 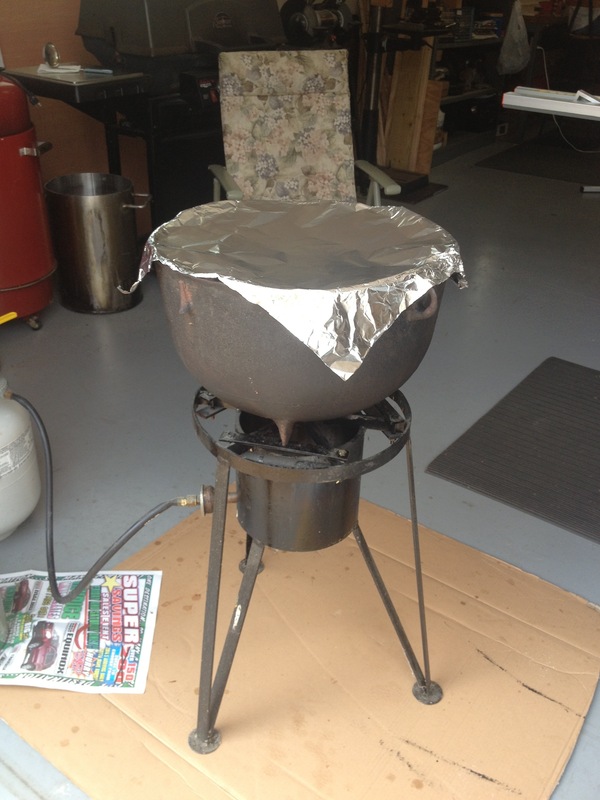 My cousin and her husband cook the stew in a huge cast iron pot over a gas flame. Enough stew to feed a small army! 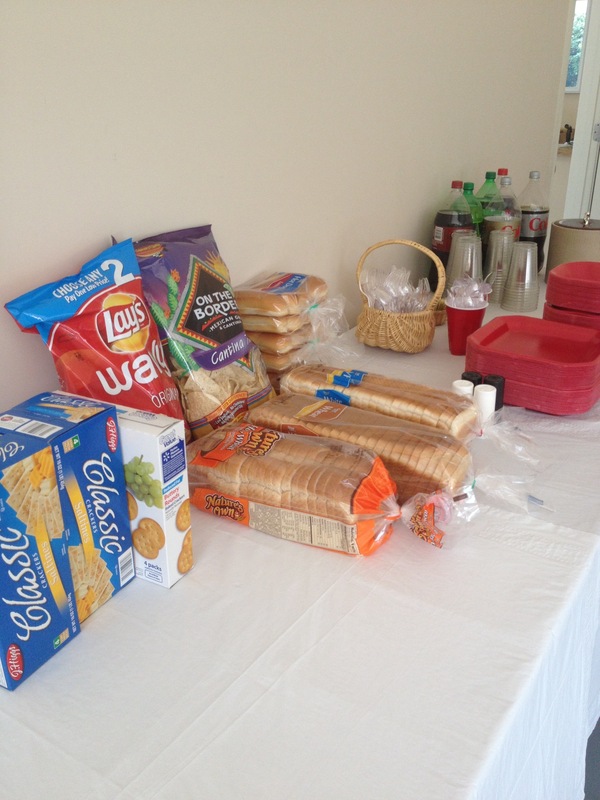 They invited lots of family and friends over, and we had the stew, sandwiches, chips, cookies and brownies. Often, it’s a little cool on Labor Day but this time it was almost too hot for the stew. Regardless of the temperature, it’s never too hot for an old tradition. Do you have any family food traditions? Like my Facebook page www.facebook.com/myglasssneaker. I am raising money for St. Jude as a charity athlete. Click here to donate.